RICHMOND — A Houston energy company has proposed building a multibillion dollar pipeline that would connect Massachusetts to abundant natural gas from Eastern shale fields, entering the state through this small town on the New York border and stretching across dozens of municipalities into the Boston metropolitan area. The proposal, by Kinder Morgan, has the potential to lower — or at least stabilize — what are some of the highest energy costs in the nation by opening up new supplies of cheap, domestic natural gas and expanding a pipeline system that is becoming inadequate to meet the region’s hunger for energy, analysts say. But the plan, which has yet to be filed with federal authorities, has sparked fierce opposition in many of the roughly 45 Massachusetts municipalities through which the pipeline would pass. “This would be a gas super- highway across the most pristine lands in the state, family farms, old New England towns,” said Richard Hewitt of Groton, which is on the proposed route. While the pipeline has received great attention in communities it would cross, it has gained little notice in the rest of the state. The proposal, which Kinder Morgan has shopped to local officials and residents in recent months, renews the long-running conflict between economic development and environmental protection, setting the need to bring energy to population centers against concerns of rural communities through which pipelines and transmission lines run. In Richmond, a place with a population of less than 1,500 south of Pittsfield, residents noted that five pipelines already run through town. At a Wednesday meeting with Kinder Morgan, many raised concerns about declining property values, the potential for explosions, and damage to forests, wetlands, and watersheds. More than a dozen municipalities have passed nonbinding resolutions against the project. The proposed pipeline would branch off the company’s Tennessee Gas Pipeline, which runs from Texas to the Northeast. The branch would stretch 418 miles from Troy, Pa., in the heart of Pennsylvania’s gas country, to Wright, N.Y., and then into Richmond, eventually sliding across Massachusetts’ northern spine to Dracut. Kinder Morgan said it plans to file its proposal with the Federal Energy Regulatory Commission, which oversees interstate transportation of gas, and begin seeking federal permits by October. State and local governments don’t have much jurisdiction over such projects. The company estimates the pipeline, which it hopes to begin using by November 2018, would create about 3,000 construction-related jobs and generate $25 million a year in tax revenue in Massachusetts. The pipeline would carry enough gas for 1.5 million homes. Regional energy officials say additional pipeline capacity is sorely needed in New England, which has become increasingly reliant on natural gas. In Massachusetts, about half of the state’s homes heat with natural gas, while about two-thirds of the electricity consumed in the state is generated in gas-fired plants. That share is expected to rise as aging coal and nuclear plants shut down. Two of Massachusetts’ three remaining coal plants stopped operating last week ; the third is set to close by 2017. In addition, Vermont Yankee, a nuclear power plant in Vernon, Vt., is to shut down by the end of the year. Northeast Utilities and National Grid, the state’s largest utilities, have expressed interest in buying space to transport gas on a different pipeline expansion project now under federal review. New England governors, meanwhile, are collaborating to increase the number of energy sources, considering options such as importing more hydroelectricity from Canada, developing wind projects, and building new gas pipelines. 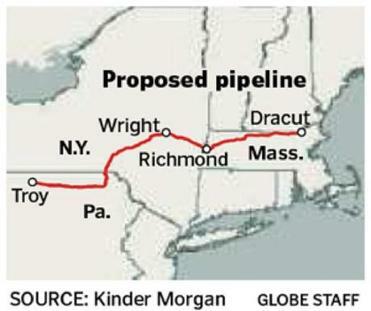 Massachusetts officials are quick to point out that more pipeline projects are not a done deal. Some residents and environmentalists question the need for new pipelines. A study conducted for the New England governors by the consulting firm Black & Veatch found that yet another pipeline would be unnecessary if — after an already-filed expansion of the Algonquin Gas Transmission line — renewable power and energy efficiency can keep demand for natural gas flat. Shanna Cleveland, an attorney with the Conservation Law Foundation, a Boston-based environmental advocacy group, said that rather than build more pipelines, the region should aggressively pursue energy efficiency and other power sources, such as wind and solar. But Kinder Morgan is moving forward. “The reason we’re looking at the project in this region is because of what policy makers are telling us is necessary,” spokesman Allen Fore told about 300 in Pepperell. Fore said Kinder Morgan’s proposal is still in the early stages, and the public would have time to weigh in. Opposition is growing, much of it organized by a grass-roots effort called No Fracked Gas in Mass. The name refers to controversial drilling technique known as fracking that has opened vast reserves in shale deposits in Pennsylvania and other states. to this report. Erin Ailworth can be reached at erin.ailworth@globe.com.